On today’s Podcast, Justin discusses everyday use of sales skills during his skill builder portion, a start to finish sales process and examples of how each step of a sales process can be implemented. Crystal discusses talking to children about cyber bullying, resources to create children emergency dialogue and natural remedies for allergy relief. 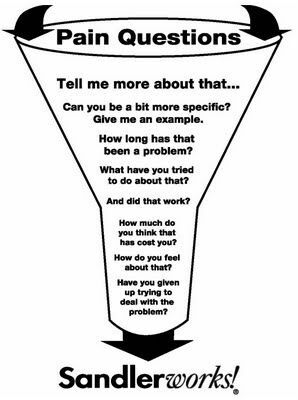 Bonus: Sandler Pain Funnel Graphic with examples of open ended questions.